It’s no secret that MaXXX Black is a big fan of Kegel exercising (or pelvic floor muscles if you like). The results from simple exercises and toys can make big differences to a woman’s health and sexuality, and it’s impact is felt as much by their partners as by the women themselves. 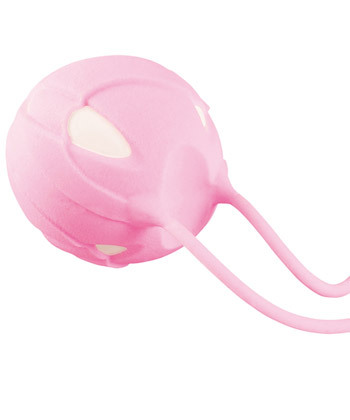 So this week we’re reviewing Fun Factory‘s kegel offering – the Smartballs Teneo Uno. Available as either a single ball, the Teneo Uno, or two balls connected, the Teneo Duo, these are slightly different in design than the original Smartballs, but they still come packaged in the Fun Factory way. The box has a clear window on the front so you can see the product, and then the back of the box has flaps that open up to reveal another clear plastic window. The insides of the flaps are printed with basic information and a product map. Inside is the Teneo Uno encased in a clear plastic clamshell, a sample of water-based lube, a small Fun Factory product catalog, and user’s instructions (printed in several different languages). Smartballs Teneo Uno are similar to the original Smartballs in that they’re hollow with a smaller weighted ball inside that rattles around, creating subtle vibration and internal stimulation. The idea is that the PC muscles will naturally contract to keep the balls in place, so that just wearing them will help strengthen your pelvic floor, but their weight also adds some resistance, giving the user something to squeeze against. Our testers noticed distinct differences in their muscle strength in as little as 14 days. For most women, with daily use, you will start to notice changes (and they are GOOD changes) withiin a month. Interestingly, it was our testers’ partners you noticed changes in muscle strength and ‘tightness’ first. For women who are looking at duo balls, geisha balls or kegel exercisers for the first time, the Teneo Uno is ideal. It’s lighter weight and shorter design will be easier to hold in. They’re almost totally silent and the mild vibration caused by the internal ball are subtle but still pleasurable. Combine it with your favourite clitoral vibe and you’ll have a fantastic solo play session too! Like all of Fun Factory‘s toys Smartballs are made from 100% Phthalate-Free Silicone and are safe to use with water-based lubricants. In fact, your kegel exercises are going to be easier, more fun, and more pleasurable with a little of your favourite glycerin-free lube. Smartballs Teneo Uno and Teneo Duo balls are available from MaXXX Black’s web-store and Newtown store from just #35.00.